There was no F&B meeting last week due to Veteran’s day, so there will be no Week 7 Finance Report. I hope you all are enjoying the break! 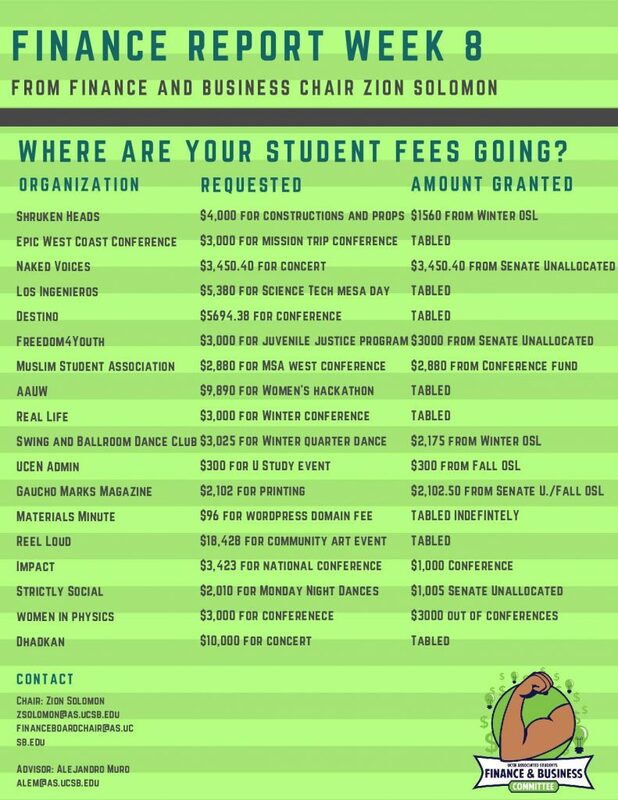 🙂 Please reach out to me financeboardchair@as.ucsb.edu if you have any questions about funding. 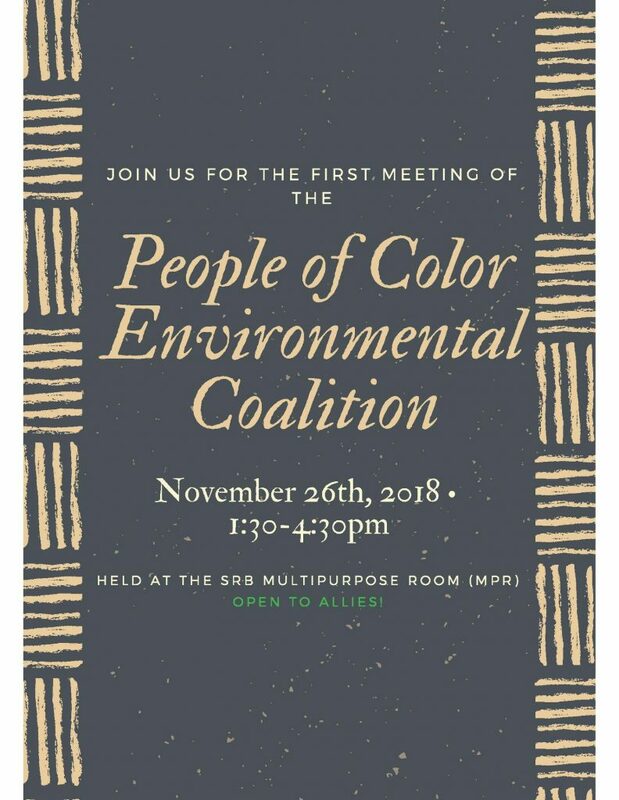 EAB is hosting the first meeting of the People of Color (and allies!) Environmental Coalition from 1:30-4:30 PM in the SRB MPR. This is open to undergraduates, graduates, faculty, and staff! We will be having a drop in forum and addressing questions related to environmental justice awareness and education at UCSB. 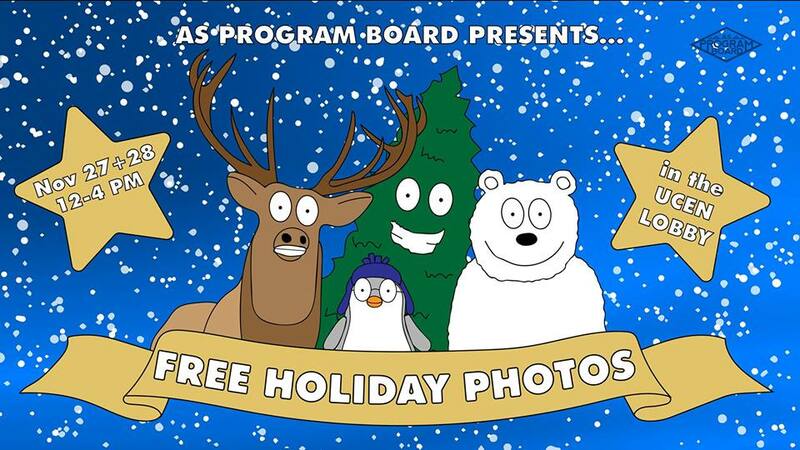 AS Program Board Presents… FREE Holiday Photos in the UCen Lobby! The holiday season is right around the corner! Grab your friends and take your holiday photos from 12-4pm on Tuesday, November 27th and Wednesday, November 28th! Photo booth and pictures will be provided! Dressing in festive holiday attire is encouraged! It’s that time of the year again! Renting and leasing in Isla Vista can be a daunting task, but we’ve broken the process into easy steps. We’ll be going over what to look for in your lease, as well as providing free pizza, so come on out! Want to know what happened at the AS Senate meeting last night? Watch here. 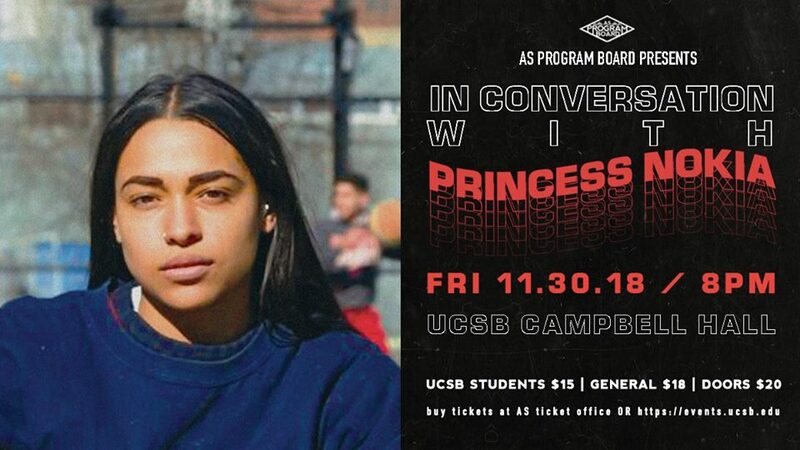 Destiny Nicole Frasqueri, otherwise known as Princess Nokia, is a Nuyorican singer, rapper, urban feminist and self-identified bruja who has taken the music game by storm. She channels her Afro-Latinx and Indigenous roots with a Spanish Harlem attitude, creating a prismatic body of work that aims to challenge the constructs of music and unite women of color. She is a founding member of the Smart Girls Club, a collective aimed to inspire feminist collaboration through various workshops and radio shows. She has been featured in Vogue, Noisey, Paper Mag, iD, NPR, Dazed, among many more. Zero Waste Committee is hosting a Waste-less Workshop where students can learn how to reduce waste even with a busy college lifestyle! It will be this coming Tuesday the 27th in the SRB room 1219. 7-8:30! 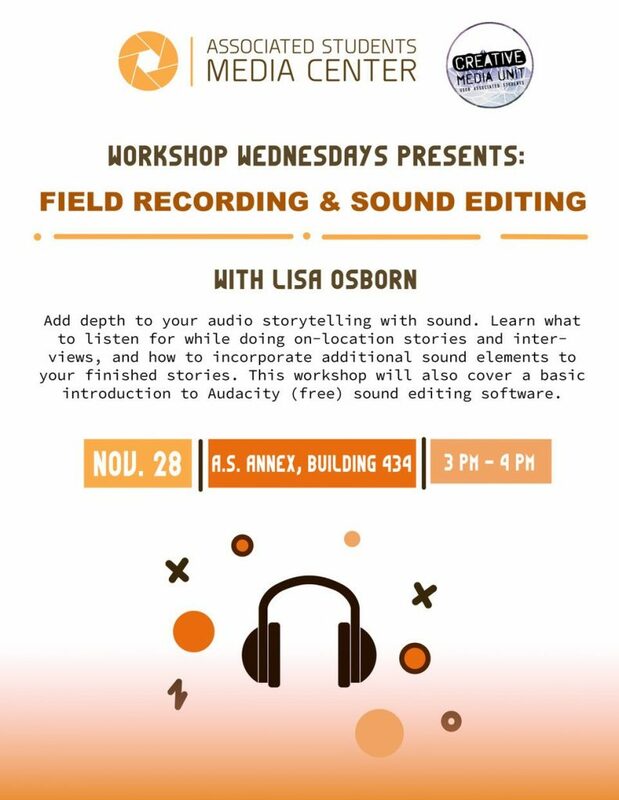 Join us for the last Workshop Wednesday of the year, “Field Recording & Sound Editing” with KCSB News Director Lisa Osborne, November 28, 3-4pm in the AS Annex, Building 434 Room 141H, right next to the Storke Tower bike circle. Students, staff, and faculty welcome. 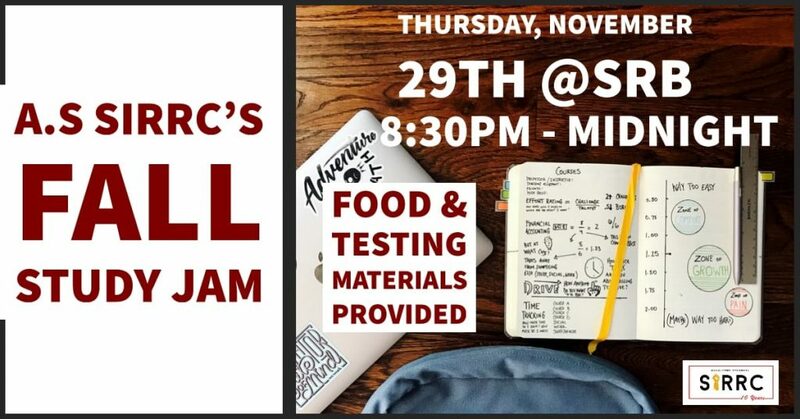 AS SIRRC will be holding our 2nd study jam of the quarter! Need a study space for your finals? Come on over to the SRB on Thursday, November 29th from 8:30PM – Midnight! We will be providing FREE snacks, food, coffee & tea, and testing materials! The last Free Tuesday Film of the quarter is TOMORROW @ 10pm! Bring snacks, friends, and your access card to IV Theater for a showing of Assassination Nation, courtesy of AS Program Board! Zero-Waste Committee is having their first Waste-less Workshop TODAY in the SRB from 7-8:30pm! Learn how to reduce waste (even as a college student)! There will be discussion, games, food, and giveaways! TONIGHT in the Hub, AS Program Board presents RAVYN LENAE! There are still tickets available ~ $22 for students, $24 general, $25 at the door ~ DOORS OPEN AT 8:30! Lili Hartounian accepted the position of HR and Payroll Analyst as a career staff, starting Monday, November 26. Lili excellently served in this position a few years ago and again during her limited appointment. Please address to Lili any questions or concerns related to Payroll, Keys, UC Path, New student hires/rehires and Timekeeping (Kronos). You will find us in AS Admin, office 2537B!